Built on four pillars, Iskele Mosque is a cut stone architecture, constructed in 19th century. Located near the Yatch Harbor, it is a quite tiny mosque which was reconstructed in Inner Bailey restoration project. Though there are not enough historical documents specifying its time of construction, it has been renovated a couple of times. 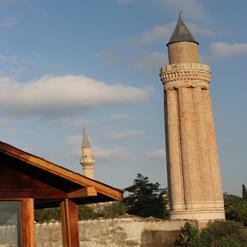 Originally named Mihrimah Yuskyudare, it is built with white stone with a short minaret.